ISBN: 9781842175149 | Published by: Oxbow Books | Series: EARTH SERIES | Volume: 1 | Year of Publication: 2014 | Language: English	432p, 235 col illus. This first monograph in the EARTH: The Dynamics of Non-Industrial Agriculture: 8,000 years of Resilience and Innovation series, approaches the great variety of agricultural practices in human terms. It focuses on the relationship between plants and people, the complexity of agricultural processes and their organisation within particular communities and societies. Collaborative European research among archaeologists, archaeobotanists, ethnographers, historians and agronomists using a broad analytical scale of investigation seeks to establish new common ground for integrating different approaches. 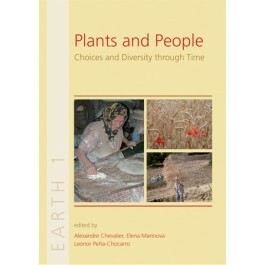 By means of interdisciplinary examples, this book showcases the relationship between people and plants across wide ranging and diverse spatial and temporal milieus, including crop diversity, the use of wild foodstuffs, social context, status and choices of food plants. "This book amply meets the proposed objectives, finding a new common ground for integrating different approaches, and viewing agriculture from the standpoint of the human actors involved." "With over 60 contributions spanning 500 pages and more than 40 authors from a dozen countries, the volume has the potential to make an indigestible meal. That it is not can be attributed in no small part to the generally high standard of language editing and, unusually for such a collection of papers, the provision of a detailed index. EARTH 1, along with its two companion volumes, will form an important and useful collection that should appear on every archaeobotanist’s bookshelves. Or should that be palaeoethnobotanist’s bookshelves? "